Postcards, as we are familiar with them today, have taken a considerable amount of time to develop. First restricted by size, color, and other regulations, postcard production blossomed in the late 1800s and early 1900s. Postcards were popular because they were a quick and easy way for individuals to communicate with each other. 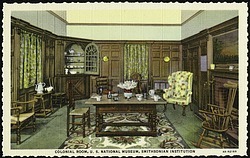 Today deltiology, or the collection of postcards, is a popular hobby. The following is a brief general history of the postcard in the United States. The dates for each time period are not concrete and different sources contain slightly variable dates. It is also important to keep in mind that postcard types produced in one period could also be produced in another, but were simply not produced in the same volume as other card types of the period. Before postcards, some people sent cards through the mail with attached postage. Because these cards are not actually postcards, they are typically referred to as “mailed cards.” During this period, envelopes were produced with pictures on them, and some speculate that postcards are the direct descendants of the picture envelopes. 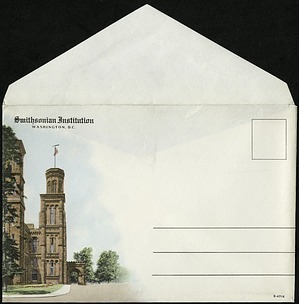 While we do not have picture envelopes that date from this time period, this envelope with the Smithsonian Institution Building on it is similar to the earlier picture envelopes. On February 27, 1861, the US Congress passed an act that allowed privately printed cards, weighing one ounce or under, to be sent in the mail. That same year John P. Charlton (other places seen as Carlton) copyrighted the first postcard in America. In 1870, Hymen L. Lipman began reissuing Charlton’s postcard under a new name: Lipman’s Postal Cards. Congress passed legislation on June 8, 1872, that approved government production of postal cards. The first government-produced postcard was issued on May 1, 1873.1 One side of the postcard was for a message and the other side was for the recipient’s address. By law, the government postcards were the only postcards allowed to bear the term “Postal Card.” Private publishers were still allowed to print postcards, but they were more expensive to mail than the government-produced cards (2¢ instead of 1¢). On May 19, 1898, Congress passed an act allowing private printing companies to produce postcards with the statement “Private Mailing Card, Authorized by Act of Congress of May 19, 1898.” Private mailing cards now cost the same amount of money to mail as government-produced postcards: 1¢. The words “Private Mailing Card” distinguished privately printed cards from government printed cards. Messages were not allowed on the address side of the private mailing cards, as indicated by the words “This side is exclusively for the Address,” or slight variations of this phrase. However, if the front of the postcard did not contain an image, it could bear a message. If the front did have an image, then a small space was left on the front for a message. 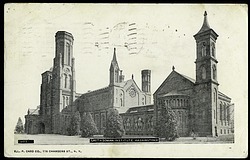 Many of the private mailing cards, like the Castle postcard seen below, also contained the phrase “Postal Card—Carte Postale,” which indicated that it was allowed to enter the international mail system. In December 1901, the Postmaster-General issued Post Office Order No. 1447, which allowed the words “Post Card” instead of the longer “Private Mailing Card” on the back of postcards. Private printers were now also allowed to omit the line citing the 1898 Private Mailing Card Act. However, messages were still not allowed on the address side of postcards. By this time, the front of most postcards had images, which eliminated it as a space for messages. Because of the absence of message space on the address side of postcards, the Post Card Period is also known as the Undivided Back Period. In 1907, a major change on the address side of postcards occurred. This change was prompted by the Universal Postal Congress, the legislative body of the Universal Postal Union. The convention decreed that postal cards produced by governments of member nations could have messages on the left half of the address side, effective October 1, 1907. The Universal Postal Congress also decreed that after March 1, 1907, government-produced cards in the United States could bear messages on the address side.2 Congress passed an act on March 1, 1907, in compliance with the Union’s decree, allowing privately produced postcards to bear messages on the left half of the card’s back. The next day, the Postmaster-General issued Order No. 146, granting privileges to privately produced postcards that were already granted in international mail, including the allowance of message space. On June 13, 1907, the Postmaster-General issued Order No. 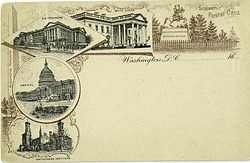 539, which allowed government-produced postcards to bear messages on the left half of the address side.3 These changes to the backs of postcards ushered in the Divided Back Period, which spans from 1907 until 1915. The Divided Back Period is also known as the “Golden Age of Postcards,” due to the vast popularity of postcards during this time period. Another type of postcard that began to be produced and popularly used during the Divided Back period and through the White Border period is the “real photo” postcard. “Real photo” postcards were first produced using the Kodak “postcard camera.” The postcard camera could take a picture and then print a postcard-size negative of the picture, complete with a divided back and place for postage. Throughout early postcard history, German printers dominated the market in postcard printing. However, with the beginning of World War I, American printers supplied most of the postcards in the United States. American printers did not have the same technology as German printers, so the quality of available postcards fell, and people lost interest in collecting them, effectively ending the “Golden Age” of postcards. Printers saved ink during this time by not printing to the edge of the card and leaving a white border around the image, giving the time period its name. Postcards from the White Border Period also had a description of the image on the message side, which retained the divided back. Beginning in the 1930s, new printing processes allowed printers to produce postcards with high rag content, which gave them a look of being printed on linen, rather than paper. 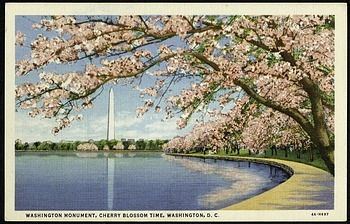 The most notable printer of this period was Curt Teich & Co., which printed its first linen card in 1931, and whose postcards became popular around the world. Teich’s process allowed for quicker production and brighter dyes to be used to color the images. Most postcards retained the white border, though some were printed to the edge of the card. The back remained divided and usually contained printed information about the image. The production of linen postcards eventually gave way to photochrom (or photochrome)4 postcards, which first appeared in 1939. However, linen cards continued to be produced for over a decade after the advent of photochrom postcards. Modern photochrom-style postcards first appeared in 1939 when the Union Oil Company began to carry them in their western service stations. Production of the postcards slowed during World War II because of supply shortages, but after the war, they dominated the postcard market. The photochrom postcards are in color, and their images closely resemble photographs. Photochrom postcards are the ones most familiar to us today. In the 1990s the advent of e-cards and email started the decline of the postcard’s popularity. Today postcards are typically purchased as souvenirs, rather than a quick way to communicate. 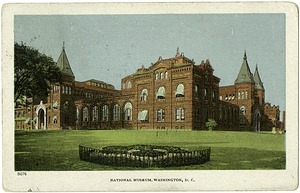 “Evolution of the Smithsonian Postcard,” Smithsonian Institution Archives. “Dating Postcards,” Smithsonian Institution Archives. “Guide to Dating Curt Teich Postcards,” (PDF) Curt Teich Archives, Lake County Forest Preserves. “Wish You Were Here! : The Story of the Golden Age of Picture Postcards in the United States,” Fred Bassett, New York State Library. “Postal History,” US Postal Service. 1 Post-Office Department, Annual Reports for the Fiscal Year Ended June 30, 1900. Report of the Postmaster-General. Miscellaneous Reports (Washington, DC: Government Printing Office, 1900), 792. 2 Post-Office Department, Annual Reports for the Fiscal Year Ended June 30, 1906. Report of the Postmaster-General. Miscellaneous Reports (Washington, DC: Government Printing Office, 1906), 58, 313. 3 Post-Office Department, Annual Reports for the Fiscal Year Ended June 30, 1907. Report of the Postmaster-General. Miscellaneous Reports (Washington, DC: Government Printing Office, 1906), 297. 4 Photochrom is spelled without out the “e” according to the Library of Congress. However, it can be spelled several alternative ways including the English version of photochrome or the German version of Fotochrom. http://www.loc.gov/pictures/collection/pgz/about.html.